I used to be. In the 1990s the city’s bridge program was headed by Clark Robins. After the 1994 Northridge Earthquake, most city bridges received a minimum of necessary seismic treatment to ensure public safety. A few bridges had extensive rehabilitation work, often including restoration of missing historic features. The city won awards and other national recognition for rehabilitating and restoring its wonderful historic bridges. Bridge consultant sharks could smell blood in the water. There was a lot of money to be made in the “make-work” process of tearing down and rebuilding L.A.’s bridges. And why bother to replace the existing neighborhood-scale bridge, when there was a more money to be made widening it to freeway-scale? I don’t claim that all this bridge work is unnecessary, but I find most of these project to be excessive. When you have a flat tire, BOE’s bridge builders would probably try to sell you a whole new bicycle… or a car. Public bridge funding was based on the number of spans to be re-done. Simple San Fernando Valley bridges only have single spans. Many complex L.A. River bridges in central Los Angeles feature multiple spans, hence they are cash cows eligible for multiple times what a single span project could pull down. The Glendale-Hyperion Bridge has at least four independent spans: the main Hyperion Blvd span, northbound and southbound Glendale Blvd spans, and Waverly Drive above. This brings us to the Riverside-Figueroa Bridge. This L-shaped bridge is located in Northeast Los Angeles; it connects Elysian Valley with Cypress Park. Riverside-Figueroa has three different spans: the main span over the Los Angeles River, a side-hill viaduct along Riverside Drive, and a span over Avenue 19. Those three spans meant a lot of bridge funding bearing down on an old bridge that has already seen its share of indignities. The initial concrete arch bridge and sidehill bridge were completed in the late 1920s. Avalanches and partial demolition left the lessened bridge that still stands today (hopefully.) Read a detailed bridge history here. About 10 years ago, the city finalized their plans to tear down the L-shaped historic bridge and replace it with a wider curved bridge. Think freeway ramp. The new bridge would be constructed immediately upstream of the old bridge. The bridge touches down in Lincoln Heights at the site of the confluence of the L.A. River and the Arroyo Seco, the site of the earliest written account of the Los Angeles area. The area around the confluence had been identified for the river’s “Confluence Park.” The confluence project was advanced by the Mountains Recreation and Conservation Authority (MRCA) – essentially a state agency that has been a leader in L.A. River revitalization. The city bridge program was planning a 4-lane bridge to replace the existing 2-lane bridge. Early traffic studies, commissioned by the MRCA, showed that current and future traffic volumes did not require doubling lane width. 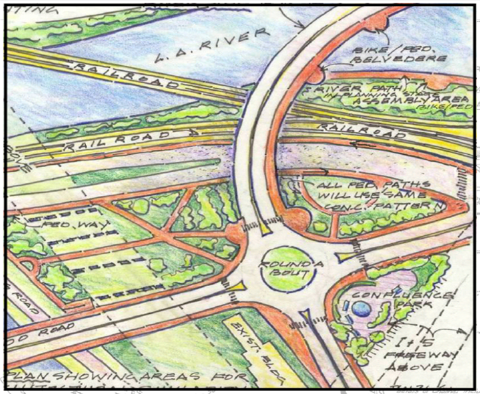 MRCA proposed less roadway and more parkland by keeping the bridge to only two lanes and adding a small traffic circle at the intersection of Riverside Drive, San Fernando Road, and North Figueroa Street. City bridge staff persisted with oversized 4-lane designs, but incorporated an outsized 2-lane roundabout at the intersection. The 4-lane bridge includes an extensiton of the L.A. River bike path. 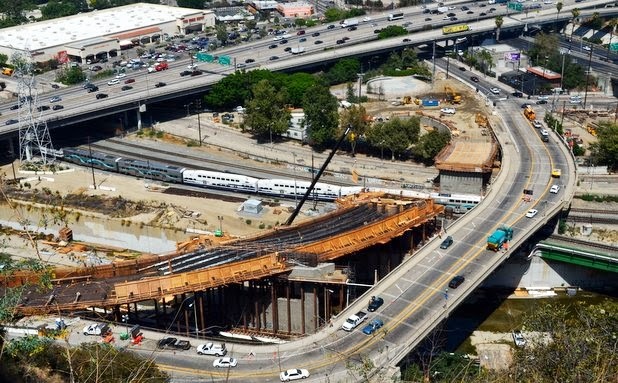 Construction of the new over-sized Riverside-Figueroa bridge began in 2011. Then a group of community architects and activists came up with a great idea. They proposed preserving the old bridge alongside the new one. The historic bridge would become a park over the L.A. River. Access would only be by foot and by bicycle. There are precedents for similar bridge-parks, including the Santiago Avenue Bridge in Santa Ana and even the High Line in New York City. Plans for the Figueroa Landbridge are on life support as the City Council and Mayor allow a flawed estimate from the Bureau of Engineering to scare them away from not demolishing the current Figueroa-Riverside Bridge. They call their proposal LandBRIDGE. See this slideshow at Enrich L.A. for excellent visualizations of how the bridge could be reconfigured. In the short run, preserving the bridge actually saves demolition costs. The LandBRIDGE story is told well in this earlier Streetsblog article and this subsequent L.A. Times article. Despite a great deal of community and neighborhood council support, BOE representatives have been saying that it’s just too late. I see the LandBRIDGE proposal as a great opportunity. It’s not a simple easy change to the project scope. Multi-million-dollar capital projects that spend a decade-plus in development are difficult to re-align… but until the bridge has actually been torn down, it’s not too late. The BOE, under the leadership of architect Deborah Weintraub, has embraced environmentally green buildings. Weintraub has embraced similar projects, but needs more community support to give her cover to do the right thing. Hopefully the city’s bridge builders can reconsider their headlong push to destroy great historic bridges, and can retool their designs to make way for a great new space on top of a great old place. Streetsblog readers can lend their voices in support of the LandBRIDGE proposal by signing this on-line petition. Hi Joe. Nice piece. To what extent does this help get the LA river bike path gap through downtown closed (if at all?) Seems like the new bridge will help a little. Right now it’s a complete mess trying to ride from downtown to the start of the LA river going north. Yes. Sadly, this will help make Riverside Dr (which would be a prime candidate for a road diet) into even more of a residential highway. The new bridge will allow drivers to hit Lincoln Heights and Cypress Park at high speed. My understanding is that the scrap value of the old bridge is actually quite high and so the construction company will not be in a rush to give up the task of tearing it down. But Enrich LA’s estimates are that the old bridge preservation and transformation would be either cost neutral or very low for how large an open space would be created. Getting around Elysian Park into downtown isn’t easy. For a route that hugs Elysian Park (shown in the slide that Sahra referenced) clearance is very tight above the railroad tracks and below the historic Pasadena Freeway bridge (it’s possible, but requires a thin expensive cantilever structure, and likely creates an unsafe gauntlet.) The city of LA’s plan (not adequate in my opinion) is to continue the bike path as on-street bike lanes on San Fernando Rd and North Spring Street. Personally, I’d like to see the city close at least half of Avenue 19 and run the bike path there, then enter the Arroyo Seco (connecting with a future Arroyo Seco bike path), and then run along the east side of the L.A. River into downtown. It’s worth a future post exploring this – soon. Actually more open space is created by pulling down the 1939 section of the old bridge. The oldest part of the bridge—the beautiful 1928 colonnade that’s buried down in the midst of later revisions—will remain. By eliminating the overhead concrete from the 1939 section as planned, a huge open space will open up on the west of the river. The open space will be clear to the sky with views of the arroyo and as deep as 80′ from the river. It amounts to 10’s of thousands of open space at river’s edge. It will be relatively quiet (down under freeway heights) and next to the historic colonnade that is structurally sound and reusable in many ways. The other thing most people don’t know is that on the west side a major portion of the 1939 section has been on block and undermined for almost two years. In community politics and planning we all need to study carefully. I initially supported the land bridge but more study revealed that it’s a misdirected idea. Best if we focus on what can be gained—looking for the best way to make bike connections to downtown and pressing for good public use of the green space and historic colonnade. I walked over this bridge with my dog a week or two ago. In its uncompleted stage, I like it. There was a fence between the car and pedestrian lanes, and there are belvederes for pedestrians to look over the river. I did not like walking across the old bridge. The sidewalk was too narrow. If I could always have a fence between myself and the automobile traffic, I wouldn’t care how fast the cars were going.